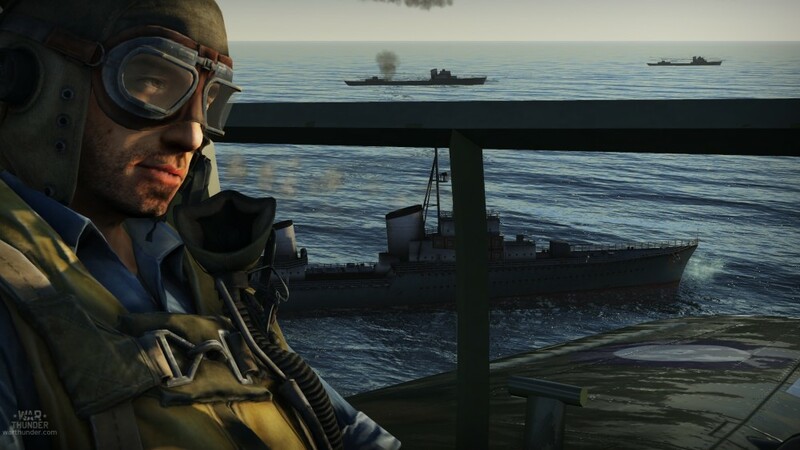 We have finally announced the introduction of Naval forces in War Thunder and we are receiving a lot of questions at the moment. The most popular question is “Why do you not plan to introduce player-controlled Capital ships? ”. Let us clarify this a little - the Naval part of the game is in the early testing stage and players haven’t seen what it actually is yet, plus some things change during a test - with your help and feedback we will together define the future of naval battle development in War Thunder. I'll start with an important clarification: in the video you saw the naval combat at the testing stage. More to any player lucky enough to not touch the existing ships in the game, but now we have something to be proud of, and we are preparing for the closed beta to get it to you as soon as possible. However, it hasn't reached that yet and we are already beginning to gather your impressions, comments, and of course, ideas, we can all then, together determine the path that will continue to develop to become, a player managed fleet in War Thunder. For ease of discussion, I will divide the explanation on the main points, each of which we'll later be able to discuss this topic. Several reasons why we are focusing on the “smaller” fleet. It is clear that game play for very big ships is different from game play in tanks or aircraft. Such a huge and unwieldy ship must have an appropriate battlefield and adapted mechanics. Cruisers can easily battle against other cruisers, what will make a head to head battle until the first hit, where the hit ship will just die slowly without any chance to strike back. No health points, no instant repair, only big ship which slowly sinks to the bottom and a player that can only watch while his ship is destroyed. This game play will bring a dubious pleasure, but it is realistic, because large ships are destroyed in this way. What about action in the locations, they need to be equal to fighting units - the players need time to re-group the ships and prepare for battle. But with dozens of minutes convergence alone, during which everything could end even before it begun - some wild hit from a distant gun, without aimed fire as there is no line of sight, yet the defeat is already quite real, and it’s over. As for interaction with other types of vehicles, here-in lies some further difficulties. In locations that are suitable for the interaction of different types of vehicles, these ships don’t just rotate on the spot so they are unusually vulnerable just to small torpedo boats. At the same time we can not afford to change the characteristics of these ships, we can not increase their speed and agility, as then it will be required of the lighter vehicles also. What is the outcome of these changes? Totally unrealistic battles, to the extent that a generic bomber will simply not be able to catch the ship, such a boost would be needed to the characteristics of the ship to allow it, for example "a cruiser" to have slim chance in escaping from under the enemy shots. Aircraft, tanks, bang - whack, bang - whack caboom, Ships, bang, ....bang......bang.....(silence) splash splash, splash (incoming) etc etc, it isn't the same, not by any stretch of the imagination. I see Battle of Britain used as an example of a long air battle, it wasn't a single engagement, battle of the bulge - again wasn't a single engagement - aircraft, tanks, SMALL ships - short lifespan in terms of single combat in our game, large, heavily armoured capital ships, long lifespan in single engagements (unless you are really lucky like in rl) Nope at this stage it just doesn't make sense. Even small motor gunboats could have a crew of more than 30 men and this is not a small number, with our “craving” for realism large ships will not fit into the dynamics of game battles. Even huge vessels are extremely vulnerable to aircraft and they had very complex tactics, including reconnaissance, protection, long range combat and even rules to their movement do not comply with the gameplay - fighting for frags and rewards. Maps could be made bigger but that would involve hours and hours of travelling only to get taken out in the first few minutes of contact, there are a few of us who would be happy to do that, but there are just too many that wouldn't. How can you count kills? In reality destroying one capital ship could take hours and hours, and, sometimes seconds - in case of ammunition explosion. With smaller vehicles it is clear - destroying an enemy brings greater rewards, damaging an enemy also brings rewards or can take several hits to destroy an enemy. With ships that have crews of over 1000 men for example, it is much more complex. It is exactly the same for the economy and research and development - even if we ignore big crews with a great variety of functions and qualifications and hundreds of different modules, there is still the question “how many millions of “lions” should a torpedo bomber receive that has taken down a capital ship with a lucky strike? For such battles we would require a significantly redesigned game mechanic - a completely different gameplay. As we know, and let’s be honest about this, not all nations had a heavy warship fleet that could match the opponents at the time. There would be nothing up front that could appear in the development of the tree and compete on equal terms with their opponents unless we use small ships to begin with. We aim not only to give you the very existence of warships in War Thunder, but also to create highly interesting gameplay as well, which would fit into the overall concept of the game, allow each player the participation of all types of equipment in a single battle. The US, Great Britain and Japan had indisputable superiority over the USSR in the number of aircraft carriers, which immediately deprives the USSR of this class of vehicle from the beginning - and yet it happened not because of the technical backwardness of the Soviet Union, but for the simple reason: the Soviet Union had not experienced a great need for these ships, because the main fighting took place both on land and in the air. The same can be said for Germany, their naval power was not the greatest at the beginning of our time frame. But how do we explain that to the many players across the world who still want to be the best? Make no mistake, many players use the soviet and German nations in game. At the same time, small class ships were common to all nations, and here they are just perfect for most of the current vehicles represented in War Thunder lines of development. One more issue is that vessels such as battleships were used very selectively, battles lasted for hours and even days and often ended with an enemy retreat or not being destroyed. Moreover ships such as the “Yamato” or “Missouri” were unique in their class, and definitely, players wouldn't like to wait in the queue because the single e.g. “Yamato” for the current battle has already been taken, or dozen of battleships in one battle without a supporting fleet will be a clumsy and easy target for aircraft. Most importantly - CBT is your chance to share your ideas that may affect the naval battle development process in War Thunder, in reality this is quite a leap for our game and we should remember that the reality of ship combat is very rarely reflected accurately in any game, join the test, give us your feedback and suggestions and we will create a mode that many will enjoy, not just a few! In summary, this isn't a definitive no, but an invitation to help “Steer” the development so as many of us as possible can get enjoyment out of this unusual game mode, you know it makes sense. Please feel free to discuss it below. Okaii so everyone who has played Navyfield will understand this. What does this accomplish? The Necessary skills to find out the Ranges of gun fire for each ship. This will allow the player to aim his Main Guns efficiently and increase battle times. AAA, Torpedoes, etc, Can still be fired by Mouse. Allow Manual Aiming - Problem Fixed, sort of. Right Scarper? Interests:media entertainment of many kinds. It might not be a definitive NO, but it sure as heck is leaning towards it. The reason most of us were exicted about the addition of naval forces, and for many, the entire reason for sticking it out with gaijin for 5 years hangs on by a thread. we need a definitive answer now, and its likely going to make or break it for gaijin, in the eyes of a few people. peronally, i think this is a slap in the face, after waiting those 5 years for this news. with our “craving” for realism large ships will not fit into the dynamics of game battles. Can you please stop with this ridiculous excuse? Arcade is not realistic, never will be and never even tried. While Realistic can already be insanely slow with people not engaging enemy 20 minutes into battle. And already ignores realism for gameplay in many areas. Edit: so you ban me for "complaining". Amazing moderation. As asked before: Can you please stop the complaining and take part in a discussion beneficial to the Naval Battles. Why?It will bring more fun and more variation in the game. You guys said that large battleship battles will be boring,maybe but IMO it depends on your map size and how the map is created. If you add a map with length of 10km,it won't be a problem at all.Big battleships fighting at close range,big cannons shooting,smoke everywhere and water splashing...THAT'S "Edited" AMAZING!!! People want big and small guns,long and short matches....shooting ships from far and close.You guys can put all these things...everyone will be happy.If it's going to be that long,add timer. 20 mins match,who got more points..wins. And please guys add French and Japanese GF. Watch the Language please ! 10 klms!!?? You do know the range of 15" naval guns is between 28 - 37 klms! This is what the Developers mean when they say the maps would be huge. What is so bad is, what can we do that tells you we what we want more clearly? We know all the problems with making a realistic ship brawling game, that's all we hear! In fact, if one reads the naval forum it's nothing but people spitting out ideas on solving those problems, instead they choose to circumvent the problem by giving us 'boats', the most disappointing answer of all! At least take a chance and let ships be terrible at first, then closed beta can be for refining mechanics. If there was something we could have done to convince Gaijin to give us ships, i'd like to think begging for ships for two years would have been exactly it! EDIT: Let it be known, I have no problem with torpedo boats, I have a problem with not having anything classified as a 'ship' period. one thing to note, we cannot just introduce dozens of types, and multitudes of ships in one fell swoop, there are radical diffences between small ships, medium ships and large ships, we had to start somewhere and this was the most logical way of introducing naval combat. When something like an entire new armed branch is added however, you dont just only consider its impact in Arcade. But all 3 gamemodes. It would not be fun to try to drive a destroyer through the english channel with the Germans bombing you, and mostly the big guns were kept away from land as much as possible unless they were shelling a beach. Now as the project progresses, I could imagine getting into larger ships. I hope frigates and some of the larger vessels gets included, but later. Let Gaijin cut their teeth on the small stuff to get the bugs worked out then, move on to the larger stuff. What about Destroyers, if I may ask? They do engage at much shorter ranges than Battleships, and some Destroyers were even faster than PT Boats. Kennedy's PT-109 could make around 41 knots, while the "Le Fantasque" class of Large Destroyers could easily maintain 45 knots for 10+ hours. This wouldn't make matches too long and wouldn't require huge naval maps. I think we will have Destroyers. The main discussion is about adding or not adding big battleships in the NF. I agree that if not restricted then the developers should try and add some large ships to the CBT. Now everyone should also understand that this is just the beginning and that the Developers will mostly likely not change the ships any time soon. So suggesting adding ships that we dont even know if the developers can do as of now is a bit fruitless. People want big and small guns,long and short matches....shooting ships from far and close.You guys can put all these things...everyone will be happy. That is also my understanding - I really hope that they will find the way to simulate rangefinding, etc and proper artillery aim so that battleships would to what they did IRL - engage other battleships and engage land targets - not chase down destoyers. But as said in my previous post - if they want to implement those ships as just bigger, slower destroyers then thank you but no - we do not need another AB style mechanism (another being bombers) in RB and SB. On movement speed and positioning: Okay? I mean... including larger ships does not preclude smaller, more nippy ships from being included, and larger vessels generally have guns capable of engaging at long ranges. If a player doesn't like mostly firing at long range targets (Usually larger vessels thanks to long flight times of shells at range), then what's to stop them from jumping into a smaller vessel capable of closing to action faster? This wouldn't invalidate the larger vessels, the BBs and such, either- while the match may start as mostly large vessels engaging each other at range with smaller vessels knife-fighting closer to the center of the map, ultimately the side whose capitals faired better in the gunnery duel would suddenly have their big guns closing to range with the smaller vessels and find themselves at an advantage. We can also counter this with map design, putting islands and other naval "cover" in play to allow both sides to start closer together so that the big guns don't spend as long moving to the fight. It may not be 100% realistic, but then neither are bombers flying alone or in very small groups in battles where the fighters outnumber them by a large margin. If we're going for realism, the entire game needs an overhaul, both mechanically and from balancing standpoints. On damage and counting kills: Do the same thing that's done for tanks. A tank in ground forces need not be destroyed to count as a kill- a mechanically intact tank can count as a kill if the crew inside are all killed. If the vessel is rendered unable to fight, or damaged to the point that it could not reasonably be salvaged, then count it as a kill. If the hull floods beyond a certain degree (Based as best as possible on how much the vessel could reasonably be flooded before being lost) count it as a kill. If systems vital to combat are destroyed (i.e. all gun batteries, ammunition magazines, engine and mobility systems), count it as a kill. Large ships tend to take a lot of punishment and naval battles last a long time, yes. Accept these as challenges, find ways to integrate this into the game in a way that is enjoyable. Suffering a lot of punishment isn't something unique to capital ships, either- I seem to remember a story of a destroyer in US service charging headlong into an enemy formation, taking withering fire, and making it back before sinking some time later. On... "Specialty"? : Tank battles weren't just formations of random tanks driving at each other or to good camping positions as is common in ground forces now. Air battles weren't a few bombers flying over a large number of fighters with airbases only a few kilometers from one another. We've omitted concerns such as reconnaissance and holding valuable vehicles in reserve before now, why can't we continue to do so? As for the limited numbers of specific ships, that's moot as well. How many prototype or limited-production aircraft and tanks do we have in the tech trees and as premiums now? The Yamato and the Missouri were not "unique in their class", either, if I understand what you mean correctly. the USS Missouri was an Iowa class battleship and the IJN Yamato was the lead ship, but not the only ship, of the Yamato class (the Musashi was the only other Yamato class ship, however). This is a non-issue: to restrict vessels based on how many were historically created would be inconsistent with air and ground battles. Here's an idea i just had, maybe you can leave the large iconic ships, Yamato, Iowa, Bismarck etc as some sort of support ships that cross into the battle 5-10 minutes into the match, maybe the top player on each team with the most score will be able to take control of the ships. From there the objectives might change to mainly trying to sink those ships. Just some ideas to toss around. Also can you pre order the packs for ps4 at the reduced price? In my opinion,80% of battle length in time is from the map. It really depends on the map...the whole point.,Map size matters a lot IMO. maybe a bit unrelated, but how will we see naval warfare being combined into the "world war" mode? and will this perhaps start up the global campaign style map for clans? WOW I am shocked and glad to see Gaijin actually asking the community to help them....Im very happy to see this and will do my best to help make the naval forces the best it can be KUDOS! !